Team Jefferson Starship reviewed this attraction on October 29, 2016. An institution for Myrtle Beach visitors and residents, Nightmare Haunted House is a small upstairs haunt that has recently had a terrifyingly effective remodeling with the help of a guest engineer. Open all year long, Friday through Sunday during off-season, Nightmare Haunted House is a terror that you can experience over and over again after October has come to a close. They also open for holiday weeks to help you celebrate in bloody style. A series of dark twists and turns, detailed rooms, and snappy monsters wait for you at the top of Nightmare’s stairs. This may be a small haunt, but it packs one hell of a punch and the monsters and staff are proud to offer the beach with an excellent source of horror. Bring your friends and prepare to scream. The ghouls at Nightmare Haunted House create such an entertaining and dialogue perfect experience that our team was required to coin a new word to properly describe their interaction with us: verbical. This is a no-touch haunt, but the conversation is on point and the monsters cannot be stumped. One of our members happened to be falling behind and had the pleasure of meeting the “prettiest” monster she’s ever been shocked by. Even the rules were delivered with wit and charm while managing to be ominous and intimidating. Not all the monsters had clearly defined roles, but their performances were terrifyingly perfect. The monsters are a bit spaced out to cover the entirety of the place, but they come together in one cacophonous scare at the end that had our group rushing for the exit, and the group behind us screaming in terror. Our team did not see any makeup used at Nightmare Haunted House, but we were able to witness some of the best utilized masks of any haunt that we’ve been to this season. The zombie that greeted us outside and then chased random passer-bys was highly believable and the shrieks that rang out were a delight to hear. The monsters did spend quite a bit of time in the darkness, so we weren’t able to judge their clothing as well. We were able to see two of the creatures during the incredibly tense finale, and while we weren’t certain of the costumes fit into the general theme, they were executed very well and not comprised of street clothes under the masks. Customer service at the Nightmare Haunted House was professional and efficient. Buying tickets was a simple and clear process, signs proclaimed pricing with no confusing language, and parking is well labeled. The parking is a short walk away, but that’s common for properties across from the shore. We noticed that for this weekend at least displaying your receipt to the parking attendant did get you a refund of your five dollar fee. Every member of the staff that we talked to was friendly and helpful, and they’re all very proud of their haunt and its constant evolution. The dark maze does have several exposed beams that fingers can get hit on, and the stairs leading up to the entrance/exit are fairly steep so it’s best to follow all the rules and never run no matter how much they’ll make you want to. Nightmare Haunted House is a creepy little gem in a strip of stores and attractions directly across from the water. The looming gates that guard the steps squeal like a horror movie scene and the lobby is filled with details and running a dire news story that helps to underline the theme of the haunt. They are well-marked and obviously a haunted house from the outside. There isn’t much in the way of music, but we figured this is because of the sounds from the strip in front of them. Stepping up to the front of the building is an experience that puts you in the mood for a good scare, as all haunted houses should be. The majority of the sound effects in Nightmare Haunted House are byproducts of the practical special effects that exit within the house. There’s not a lot here in the way of animatronics, but the creators did pack in quite a few visual effects that set the scene and tone very well. The motley crew of monsters make up for the lack of flashy effects by utilizing the detailed and dread-inducing scenery that has been hand-crafted within the haunt’s walls. Everything here is obviously well-loved and thought out, and it communicates beautifully the imminent danger a visitor is in. A few scenes could use additional lighting , but dark mazes further utilize space and keep guests from being able to judge where in the building they are or how far it is to the safety of the light. 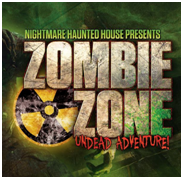 The theme of Nightmare Haunted House is heavily zombie outbreak and is well executed and intricately carried out. While it may not be the most unique of the themes, it is handled here better than at most of the houses we’ve visited this year. We did spot two monsters that didn’t exactly fit in with this idea, but the rest of the house is perfectly unified in zombie madness. Our team was delighted to see that the monsters at Nightmare Haunted House were hungry for the entire group instead of just the front or back. Scares were somewhat predictable since our group is so experience, but never repetitive. Distractions were plentiful and actors used ACTUAL dialogue instead of just screams or “Get out.” We don’t want to give too much away since the experience is one that should be had by all without much warning, but we cannot say enough about the finale and its effect on us. It was utterly unique and specific to Nightmare Haunted House and had our pulses racing as we fought to stay walking instead of running. We were particularly pleased to see the group behind us exit and actually stuck around to listen to their sheer terror as they fled the haunted house only to be scared one final time by the zombie greeter. Nightmare Haunted House is $12.99 for adults and $9.99 for kids before tax. At a roughly ten minute walkthrough time this averages out to $.77 per minute which is a pretty good value considering the level of entertainment visitors are receiving. The location does restrict the size of the haunt and causes the walkthrough to be a bit shorter than you want since the place is so very well done. On the other hand, they have utilized their space well and made sure to confuse and mystify you with dark mazes, detailed rooms, and ridiculously verbical monsters.